The 'long-nosed' P-37 was a Curtiss attempt in the late 1930s to couple the P-36 Mohawk design with the 992kW Allison V-1710-21 inline engine. The result was a pursuit ship with some promise but with a few serious drawbacks, including poor visibility from its far-aft enclosed cockpit. The sole XP-37, ordered in 1937 with a supercharged V-1710-11 powerplant, was nothing more than a P-36 airframe with the engine change. It was quickly apparent that the pilot not only could not see well in flight but also on the ground he could scarcely see at all! It was hoped that some improvement would be offered by the 13 service-test YP-37 airframes which were 0.56m longer and had the V-1710-21 engine. The YP-37 aircraft went through rigorous tests at Wright Field, Ohio, including gunnery tests, but the visibility problem was not resolved and the YP-37s were not as stable as Army pilots wanted. Serious consideration was given to further development, but at the time Curtiss was also about to come forth with the P-40 which offered an inline powerplant without the drawbacks. Though they contributed to knowledge gained by fighter designers and tacticians, the YP-37s never reached operational service as other types appeared with greater promise. As world conflict loomed, multi-role missions were now being foreseen for aircraft once intended solely to chase other aircraft, and machines capable of a range of combat functions would increasingly become known not as pursuit ships but as fighters. Rarebits (Rareplanes) did a nice 1/72 fuselage conversion for this which is pretty easy to do using a compatible P-36 kit. A kit of Resin in 1/72 scale in make by kora in the Ceck Republic. It can be had from them. Google Kora models to get thair Web sight. I built one of these by modifying a Revell/Monogram P-40C in 1/48th scale. I moved the cockpit aft. Gave it side-mounted radiator intakes and cut in the intercooler vents and made new exhaust stacks. Used a turbocharger from a P-38 and the canopy from a P-51B. It won a model building contest and, after more than 30 years, it's one of my favorite models. A plastic model kit is available, imported by Joe's Hobbies in NJ. 1/48th scale. I know joe ott, made a kit of the XP-37 with a 22inch wingspan, but i can't find a copy of the plans any where. In late summer 1939 I was assigned to the newly activated 23rd composite group at Maxwell field, Alabama, which was designated to be the operational test group for all Army air Corps aircraft and their weapon systems. During the late fall of 1939 I flew several missions in the P 37 to determine its suitability and its gunnery capabilities. The gunnery tests were conducted at what is now Eglin Air Force Base, and over the Gulf of Mexico. The test group activated Eglin on one July 1941. A P-37 WAS DELIVERED TO CHANUTE FIELD IN THE SUMMER OF 1940, FROM WRICHT/PAT. I WAS AN INSTRUCTER IN THE ENGINE BRANCH AND THE ONLY TURBO CHARGERS WE HAD WERE ON P30/PB2. THE P-37 DID NOT HAVE A TURBO ON IT. I HAVE NEVER HEARD OF TWO MECH UNITS DO YOU MEAN 2 SPEED? Essentially, The P-37 was a development of the P-36 (Hawk 75) fitted with an Allison engine equipped with an exhaust-driven turbo-supercharger in an effort to improve performance at higher altitudes. Because the supercharger was placed behind the engine, the pilot's cockpit had to be re-located further aft in order to maintain the airplane's balance. The result had a unacceptably detrimental effect on the pilot's view from the cockpit. In addition, the turbo-supercharger proved to be unreliable. Those were the principal reasons why the fighter was not accepted. The P-40, which had a less cumbersome gear-driven supercharger and a better pilot's view, was accepted for production instead. s what we call a technology demonstrator. At one point, it was equipped with three superchargers: two mechanical and one turbo. They found, that the hubs for the Turbo, extended too much from the fuselage. That created too much drag and top speed was only 290mph with the Turbo. That's why the cockpit was so far back: too make room for all the superchargers. It was in fact:The first three stage supercharged aircraft. I love this aircraft! It was Pinnacle to the war!!!!! What happened to the P-37 model that AM Tech was going to bring out.Wish some one would pick up on it!!!!! stearman 995--If you mean a model kit, I built one from a kit in the late 1930's. I believe it was a Comet marque. I saved my plans for a long time but they got thrown out while I was in the US Army. Was this airplane ever kitted? If so,area kit or plans available? Thank you. 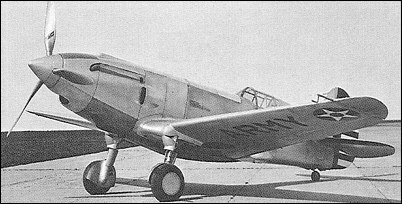 The XP-37 differed slightly from the YP-37, but both were turbo supercharged.